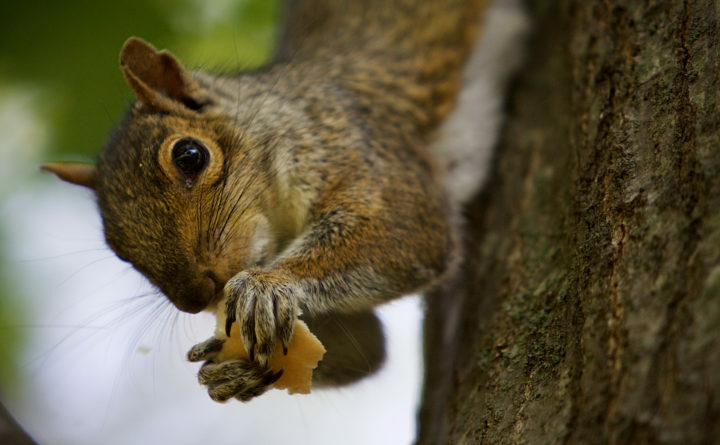 A squirrel munches a piece of bread after taking it from man's hand in Deering Oaks Park in Portland, Aug. 19, 2015. More than 3,500 customers in northern Penobscot County suddenly lost power Thursday morning when a squirrel got into some electrical equipment at a Millinocket substation, an official said. The widespread outage, which occurred around 9:45 a.m, affected Emera Maine customers in the Millinocket region, spokeswoman Kendra Overlock said. Crews hope to restore power to all 3,586 customers by 1:30 p.m., she said. The company wasn’t sure at first what caused the sudden outage. But by 10:30 a.m., workers discovered the cause was a familiar culprit: a squirrel had snuck into the substation, causing the equipment to sense a disruption and shut down automatically, Overlock said. Substations feed electricity from high voltage transmission lines to the smaller distribution cables that power homes and businesses. “In order to protect the system, the equipment causes the outage by stopping the electricity from flowing through the system,” Overlock said. A fence guards the substation, she said, but animals still work their way into the equipment from time to time. A dozen other outages across southern Penobscot County were not caused to the squirrel, but are “normal, day to day outages” that happen sporadically in breezy weather, she said.